I finished a shawl over the weekend and was down to one project-the featherweight cardigan (blue project on the left, hee hee I mean on your right!). I love that giddy feeling of starting a top down cardigan and I knit full steam ahead until I divide for the sleeves......then because of all the stockinette I get a little bored. That is why I like to have more than a couple of projects on the needles. Then I can switch around. So I casted on a pair of socks for my husband in gray. He loves hand knit socks! I will make up a stitch pattern when I get the cuff done. I always cast on a multiple of four (68 stitches for him). I have a generic vanilla sock pattern that is memorized. So since I'm on the cuff, I don't know what the sock's future holds yet. The Story Sisters-oh! It was such a good book and if you have been reading this blog, I read it "fast". It's not a very happy book but I loved her character description through life's events. I enjoyed the plot and the writer has such a lyrical magical style to story writing. I think I might read it again to absorb more of the creative writing. So yes, I do recommend this book. What are reading and knitting? i can't wait to see your finished featherweight cardigan! The blue is lovely! I read something in my Elizabeth Zimmerman book about how she didn't agree with top down sweaters/cardigans because there's nothing to look forward to that way. Your books sound very interesting - isn't it wonderful when you get stuck into something new and then read it again and again just to squeeze everything you can out of it? Joy, indeed! A very pretty color of yarn. I can't wait to see how it turns out. My husband has been after me to knit him a pair of socks for quite some time. We laugh because where we live doesn't support wool socks most the year. Happy Knitting! Mom says she read The Weird Sisters and really enjoyed it. I love your photo today :) The blues in your yarn are lovely - I can't wait to see how your cardi turns out! Your sock knitting is ever inspiring! So looking forward to seeing your cardigan! 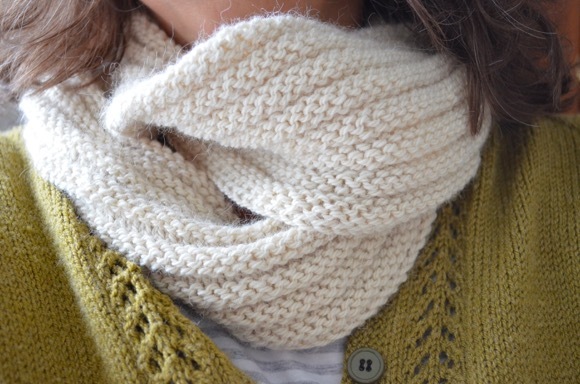 I love the idea of knitting from the top down. Those blues are lovely! I keep coming across Weird Sisters---anxious to see if you like it. Guy socks!---must you knit for miles like I have to???? It always makes girls socks seem to go so fast afterwards!!! Speaking of FAST---that featherweight is really trucking along---can't wait to see it finished! I know what you mean, stockinette is boring. I am doing a shawl that is almost all stockinette. So I give myself a goal of doing at least 5 rows a day. I do like your shawl and all its colors as well as the blue. What type of yarn did you use? I love top down patterns. I am the same way with cardigans. I love how you describe it! I just started reading "Jane Eyre" ~ I know, all these years and I've never read it! Only problem is the print is soooooo fine my old eyes are really struggling! I swear it's like in a 7 or 8 font or something! Hopefully the library will come up with another one for me that is a little kinder and gentler. Can't wait to see your socks ~ I have a want-to-knit-anything-but-especially-socks obsession! You do such lovely work. that mottled yarn on the right is beautiful, look forward to the finished product! First off, your header is spectacular! I love starting top-down cardis too, and then I also get bored. Oh well, that's what movies are for, right? Thanks for the book suggestions, I'll have to look those up. I love the colors in your featherweight!!! Can't wait to see it done!! That is such a beautiful yarn you picked for the featherweight cardigan. I can't wait to see it finished. the blue cardigan on 'your other left' is going to be wonderful, Karen! HA! I need you as my proofreader :D Why is it that I really thought left? Anyways, I am sure glad you knew what I was talking about. I love the colors in the yarn and your pictures are always so calm and peaceful to look at! Gorgeous yarn....I didn't know they wrote a book about me and my sister ;) Can't wait to hear about that one! Can't wait to see the socks Karen,knitting socks too these days. I agree the colors of the yarn is beautiful! I typically knit the same sock pattern that I have memorized also. I add a little pattern here or there for some variety! It's my comfort knitting, so to speak. I am really excited to hear your review of the Weird sisters... I am interested in it, but when I read the first few pages a while back, I didn't like the way it started. Your socks sound exciting! Can't wait to see them finished. I love that blue yarn!! 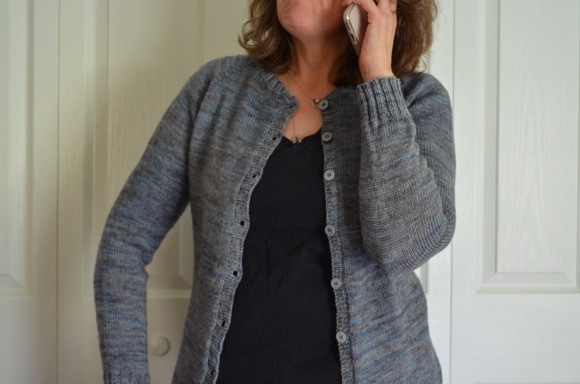 I almost signed up to knit a featherweight cardigan for my second project this summer. I ended up not moving forward as the loads of stockinette with thin yarn worried me. I listened to the audio version of the Weird Sisters last year. I will definitely need to add Story sisters to my never ending list. I always tend to have an escape project (or two) when knitting something big. I am tempted right now, but if I don't stick out those sleeves I worry that it'll take me forever..
Hope your new book turns out just as good as the last! I'll be interested in seeing what you think of that book. I have it on my to-read list. Your shawl is gorgeous and all glittery. Love it! I'm still slogging along on the Diminishing Rib Cardigan and reading Darth Vader and Son. Can't wait to be done with this blasted cardigan. So glad you finished your shawl! oh karen, i wish i could just sit down with you and see all your beautiful knits in person, and your sock method is brilliant! Love the blue yarn, can't wait to see your finished cardi. The blue yarn is beautiful. I actually love all of the color in that photo! I can't wait to see your cardigan. Same colors I would pick:) Thanks for the book recommendation! I love the colours in your cardigan, it's going to be gorgeous and I'm looking forward to seeing how it developes! Your cardigan is looking beautiful. The cardigan I've started is knit from the bottom up and is mainly stockinette stitch, so other projects are going to keep me sane I think! Thanks for the book recommendation. I've just ordered it online from our local library. Oh, your shawl turned out simply gorgeous...will have to add that pattern to my list. Memorized patterns are like a well-worn pair of jeans; will look forward to seeing what stitch pattern you go with for the socks.